 Sensitivity (Bit error rate) can reach -80dBm.  The change range of output’s power: -4 - +6dBm. Has an EDR module; and the change range of modulation depth: 2Mbps - 3Mbps. Has a build-in 2.4GHz antenna; user needn’t test antenna. of 30～40mA. The current during communication is 8mA. 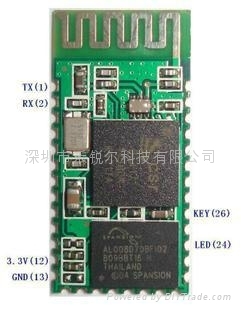 This module can be used in the SMD. It’s made through RoHS process. The board PIN is half hole size.  Has a 2.4GHz digital wireless transceiver.  Bases at CSR BC04 Bluetooth technology.  Has the function of adaptive frequency hopping.  Peripherals circuit is simple.  It’s at the Bluetooth class 2 power level.  Any wave inter Interference: 2.4MHz，the power of emitting: 3 dBm. produced. For example, when RS232 or TTL is being processed, some signals may decay.